That looks like a good pour. I am not sure about the small blowholes though, what type of sand are you using (water or oil-based?). And the amount of slag you are getting sounds a little excessive. I get very little slag and only need a light skim, but I start with clean iron. Looks like you are on a roll. And very conservative fuel usage too. First change, built a new cope 2" deep in place of the older one 3.5" deep. Results were a general further improvement over the last pour. Finish was greatly improved, though corners were more rounded (result of blacking). There were still a couple of minor holes, though they looked like they would be removed when the surfaces were machined, and the channel bored to 1" dia. 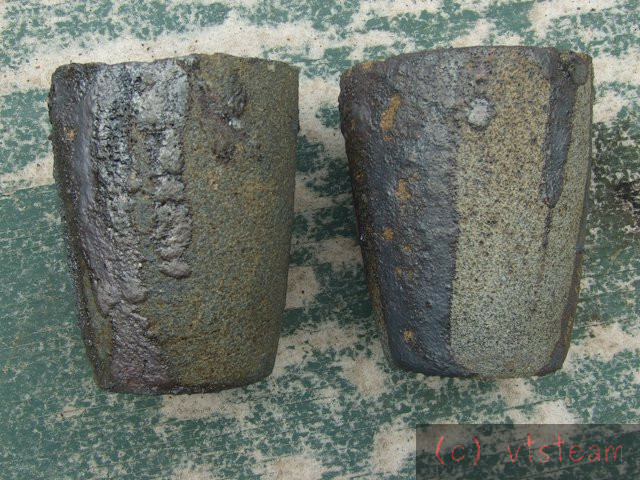 The main problem that came up was again my mis-estimate of the amount of slag/vs metal in the pot, and a nearly short pour as a result. I did not fill the sprue and riser completely, though they filled sufficiently to make a good casting. 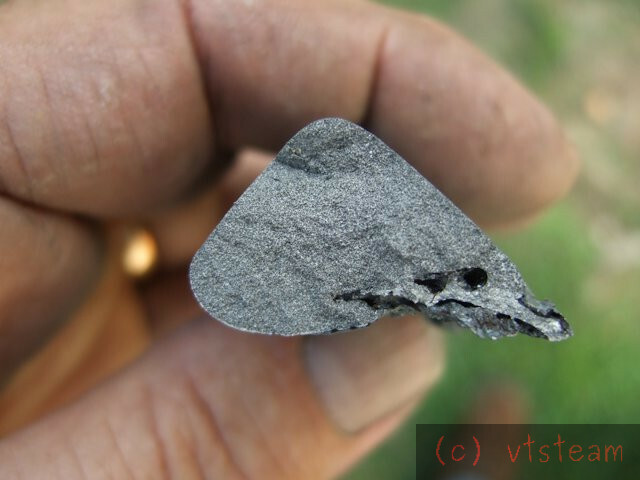 I really need to slag out the crucible while in the furnace, rather than out, so I can get a better visual take on the amount of metal in the pot -- and can add more if needed. The slag is very puffy so it takes up a lot of space. 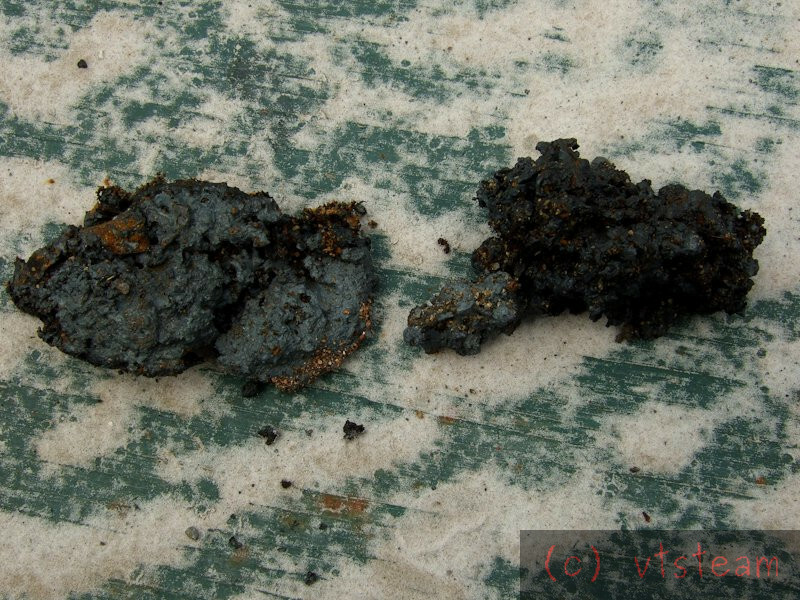 The slag used to appear much smaller when I used a flux which liquified it. Now it's got the appearance of cottage cheese. Last pour I scraped it in the furnace and added more metal -- there was plenty for the pour. This time I didn't scrape it beforehand and assumed I had enough metal. I had no trouble with the shallower cope, and I think it is going to be an improvement. I think the riser and gating were good, except that the gates could have been bigger -- the pour went unusually slowly. Possibly because of the lower head pressure of the thinner cope. I think a completed pour with more metal might have made a very good part. The greensand is traditional silica sand and bentonite, per ironman's formula. 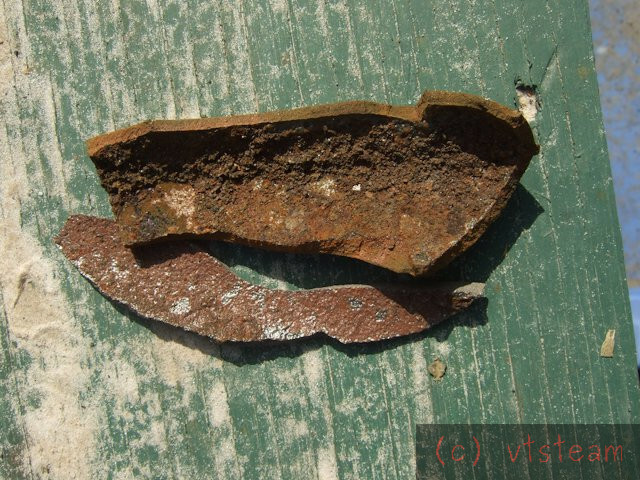 The iron is from broken up cast iron radiators. 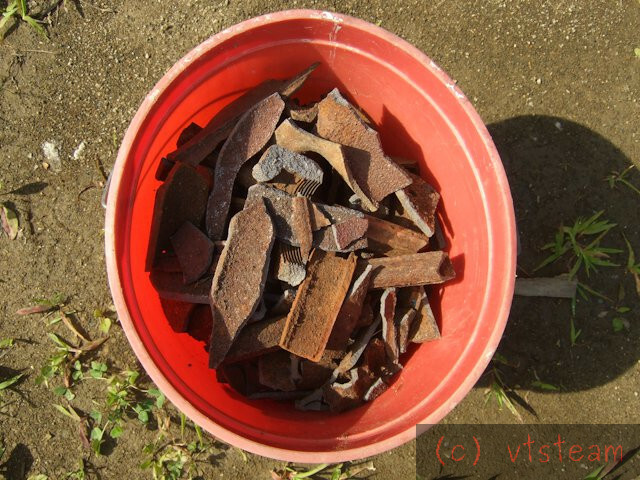 The pieces are thin, and so probably would make more slag than thicker iron. Cast Iron radiators of the finned 'school' or 'hospital' type are usually a high phosphorous iron and as such should be very fluid when pouring but rather hard to machine. From what you've said earlier your castings machine nicely which is at variance with this - just an observation. Yes Andrew they do machine well -- better in fact than I had thought (and mentioned) earlier. I believed that they were rough on a HSS end mill and said so at one point, but I think that was just trapped silica sand particles and scale on the surface, not the underlying metal itself. I did use a hand grinder to try to remove the outer skin before milling, but didn't get everything. After milling I drilled the same piece through, the drill cut beautifully -- very clean sharp holes, and those nice little uniform bits of swarf mixed with graphite, and a good rate of penetration. I have no carbide tooling other than a bunch of odd shaped inserts I bought at the Bernardston engine show. I really need to make some kind of milling holder for them -- some kind of fly cutter -- so I can clean off castings without wrecking my HSS mills. I also don't have an HSS milling cutter sharpener fixture -- just a bench grinder. I do have a big box of used end mills someone gave me -- hundreds of them, so I would like to be able to sharpen them. I also have a boxed new green wheel. Takes time to get from A to B like this. Can't melt today because of rain. Here are some informational pix from the melts so far. 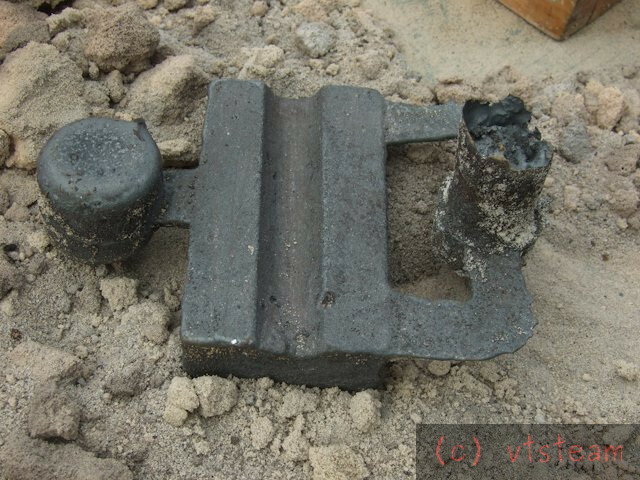 First set is of three broken ingots, left after pours. I'm not sure which pour goes with which ingot. But they are definitely 3 different pours (or attempts to pour). The next two are the two crucibles used. The one on the left was retired after 3 melts/attempts. It was used with a flux of soda ash (sodium carbonate). The one on the right was used without flux. Also 3 melts. You can see the difference in the slag in each -- especially at the bottom. 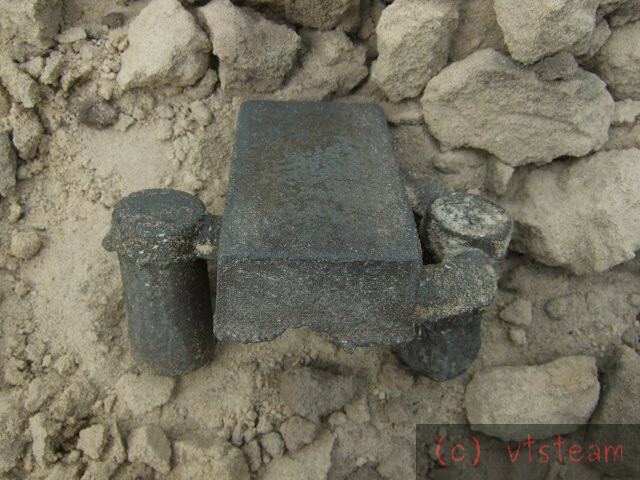 This crucible is coated with rough slag, but is still usable. The wall thickness is greater and it has retained its shape. In the side view the ceramic looks much better. The slag on the exterior also looks different. 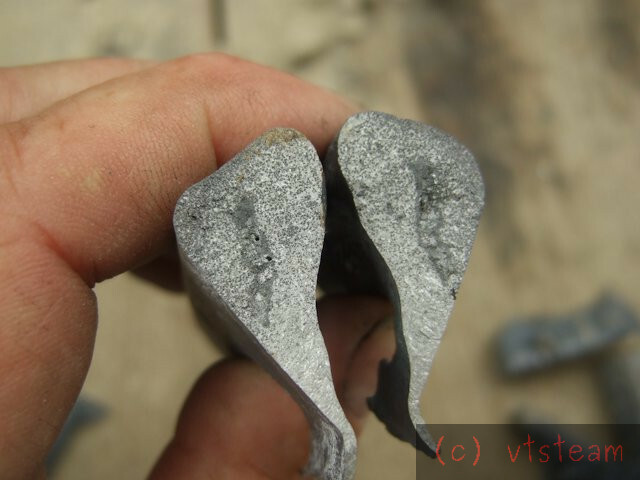 Finally, some not very exciting pictures of slag scraped off of the second (unfluxed) crucible. Texture and appearance is like very sticky cottage cheese when molten. It is very tenacious and difficult to scrape, even hot. The residual slag is suppose to be scraped out of the crucible immediately after a pour, but I have found that to be easier said than done. That slag is tough stuff. I don't have anywhere near the slag you do, perhaps 1/20 of that or less. It looks like you are making real progress Steve. I am following with interest, as I know very little about this and hope to get into it (if I can get my burner working). Thanks Mayhem, it's all new to me as well -- thought I was reasonable at casting when it was aluminum, but iron is definitely teaching me patience, here. I think the shrinkage issue may be solved, the main things I need to work on are bubbles and slag removal. I'm going to push my limits on what I think of as usable sand in terms of dryness and light ramming to try to get permeability up. I do also vent the sand with wire. Those are the little holes you see in the picture of the cope sand, back a ways in this thread. Cope depth has been decreased to 2"
For slag reduction and removal, I'm going to try a little crushed oyster shell as a flux this next pour, added later in the melt. I hope this will cause less crucible erosion than I had with the soda ash. That does look a bit crusty on the one piece. I only use clean metal to avoid slag problems. I bought some ground corn cob, and will either be wire brushing my metal, or sand blasting it with corn cob. I tried using some baking soda and salt with an aluminum pour, but then tried it again without either, and still had good results, but again starting with clean metal. I have seen others around here use radiators, but I have not had trouble (yet) with just regular gray cast iron as far as being fuid enough to pour. 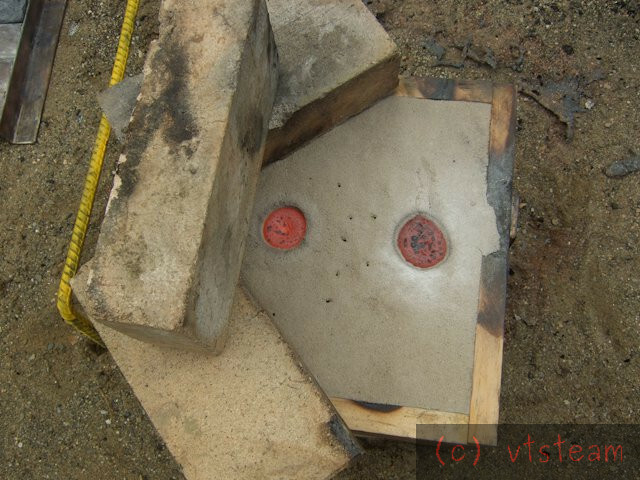 Those high-temp pyrometers are quite expensive, so I only use one with brass/bronze/aluminum. For cast iron, it is just sort of a look/feel/time guess unfortunately, but it does get fluid enough to pour. I can't dilly-dally around though after pulling the crucible out of the furnace, it has to be poured straight away or it will get cold in a hurry. I need to make one of those scapers. After uttering a few sentiments that would have made doubleboost blush, I re-grouped, dumped the flask in a wheelbarrow, re-loaded the crucible, started the second melt, and rammed up a new mold. This time instead of the radiator scrap, I used one of my earlier castings, a sprue and an ingot -- figuring these were all clean metal, and much more massive than the other stuff. I hoped for a lot less slag and a good pour. It melted pretty quickly in the hot furnace, and I dumped in about an ounce of crushed oyster shell. This did seem to liquify the slag better. I had a fuller pot of metal, it seemed, too. When it seemed hot enough I pulled it out scraped the slag -- much less and better behaved, checked the fit in the shank carefully. and poured. Unfortunately I thought I saw a small bit of slag go in part way through the pour -- I hoped it would be trapped in the well or gates. If I'd had a partner, he (or she) could have held back the slag with a rake. There always seems to be a little bit clinging to some part of the crucible. Here's what the second pour looked like -- nice and neat. Not like the first!! 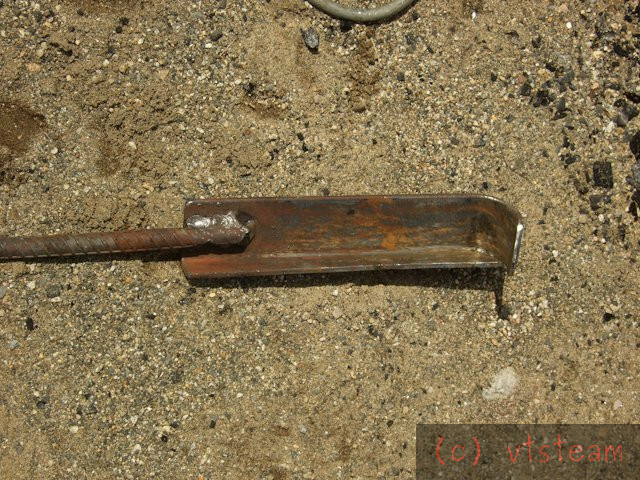 I had enough at the end to pour an ingot -- a bit of slag dropped in when I tipped the crucible all the way here, too. While waiting for the mold to cool, I broke the ingot in half to look at the grain. Looks good, and uniform gray, except for the bit of slag. Breaking out, the bottom of the casting looked good -- graphite blacking was helping some -- also corners were relatively sharp. This time sprue and riser were well filled -- though short, since the cope is only 2" deep. That looks like good clean metal. I made a crucible retainer for my smaller crucibles, but it was not a positive engagement, and so the crucible shifted when I went past 90 degrees, and sloshed metal everywhere. 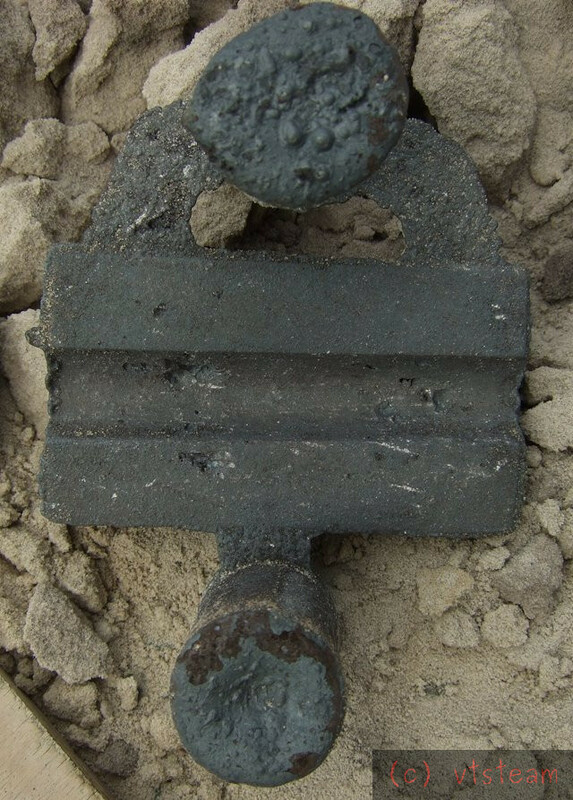 The sliding/locking retainers seem to work best, and they make positive contact with the crucible. We need to get you a web cam so we can watch the action. Hopes were up but after cleaning the sand off, no good. Same old story with a new set of words. 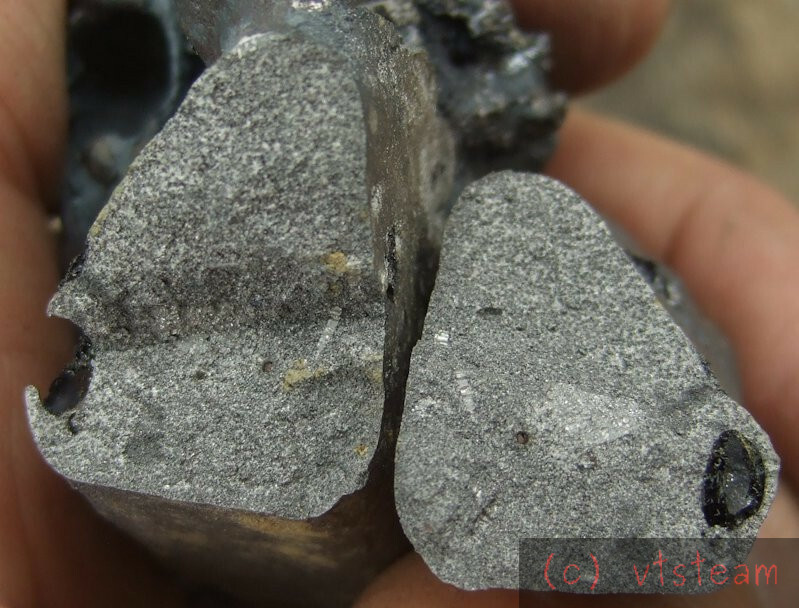 Slag inclusions. Pretty sure these aren't the same as the blow holes I got earlier -- not sure if they show well in the photo here, but in real life they are rougher irregular holes and look like inclusions inside. So, I'm not sure if I was successful in totally getting rid of blow holes, or partially successful, but I did manage to get a different problem this time. Well, slag has been a problem, one way or another all along. It seemed to be no problem when I used sodium carbonate -- but of course, crucible lifespan was a problem. I might go back to soda ash, but this time added just before the pour -- as the oyster shell was. Maybe that will give me truly liquid slag that I can skim off completely. It was like green syrup before, not this slushy stuff. Using "clean metal" seemed to help some, as did shell flux, but it's just not enough here. Just out of curiosity have you thought about casting it the other way up ? As ironman said, it can take years to get the methods and materials figure out. I am suspecting your sand mix, since your risers and such appear be be breaking with a clean interior. Ironman had a lot of trouble with sand when he started. Do you have any sodium silicate and CO2 you can try?